Before there was the Sentry, Marvel's Superman was Gladiator (Kallark), the the leader of the Shi'ar Imperial Guard. There have been comic covers such as Fantastic Four #249's which refers to him as a Super-Man...the hyphen is obviously added for legal reasons. He was created in the 70's and has gone through periods of many appearances to not showing up for years at a time. In Marvel's, now 5 plus years running, cosmic stories you can only go so long before bumping into the Shi'ar, and that means Gladiator. 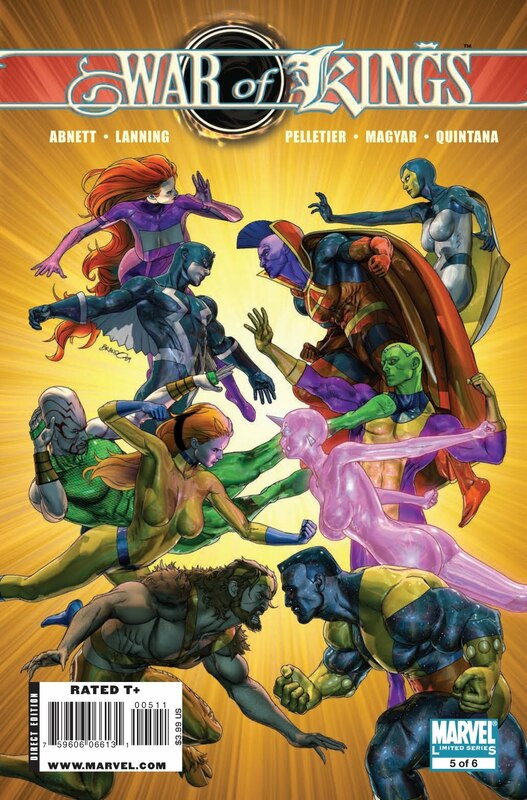 War of Kings is part of the ongoing cosmic adventures and specifically deals with the Shi'ar race and who will rule them. 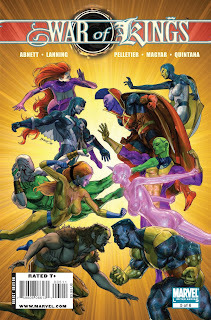 The comic of the day, War of Kings #5, features some rage filled irregular battling from the mo-hawked Marvel. Gladiator, enraged by the true ruler of the Shi'ar, Lilandra, fights his former allies to hunt down the Shi'ar traitor responsible for Lilandra's death. Before he can get to the man behind the act Gladiator must go through an elite Shi'ar combatant named Black Cloak. He is a large monstrous being with a massive spear which he uses to cut into Gladiators hip. Black Cloak has his spear to Gladiator's throat when out of nowhere Marvel Girl explodes the head of Black Cloak. Gladiator then goes on to massacre the evil Shi'ar responsible for Gladiator's rage. War of Kings #5 isn't much of a single issue but I do enjoy seeing Gladiator go nuts. In other comics he fights with a calm demeanor and controlled use of force. To see him emotional is rare. Turns out...he's a big softy.